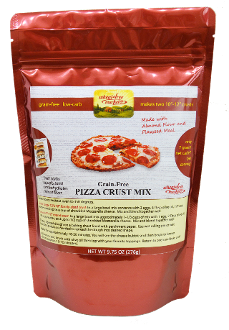 This quick mix is based on the Wheat Belly almond flour pizza recipe. A real time-saver! Simply add oil, water, eggs, and cheese and you are off to the oven. The package makes 2 10"-12" crusts or one really large 12"x16" family sized crust. One-third of a 12" pizza crust has just 7 net carb grams. Ingredients: Almond Flour, Organic Golden Flaxseed Meal, Chickpea (Garbanzo Bean) Flour, Onion Powder, Garlic Powder, Dried Oregano, and Sea Salt.